Above - The Manchester Library, the original home of the Library Theatre, in April 2015 - Photo M.L. 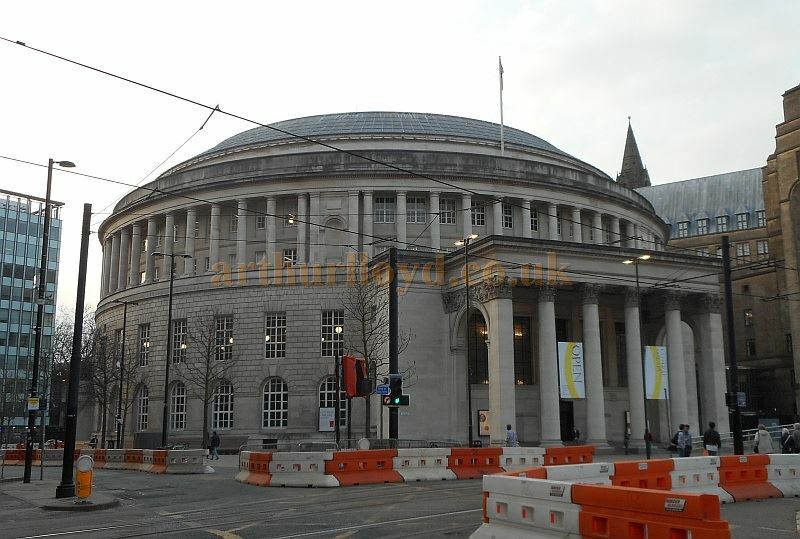 The Library Theatre in St. Peter's Square, Manchester was built in 1933 by E. Vincent Harris, who also built the Library itself in 1928. The Theatre was originally intended as a Lecture Theatre and was situated in the basement of the Library building. The Theatre had a small fan shaped auditorium with an Apron stage and just three dressing rooms. The capacity in 2009 was 308. In October 2009 the Theatre Royal, Peter Street was put forward as one of the proposed new homes for the Library Theatre Company and if this had happened the Theatre Royal, which is Manchester's oldest surviving Theatre, would have been restored and put back into use as a live Theatre again. Sadly it turned out to be too expensive a project and the scheme was abandoned and the Library Theatre itself closed. The Library was later reopened after refurbishment, but the Theatre has since been relocated and reopened as part of the 'Home' complex on First Street in Spring 2015. The building also includes the Cornerhouse Cinema and Galleries, which moved out of their then home on Oxford Road. Danny Boyle was announced as patron of Home in January 2014. You may like to visit Home's own Website here.